The image below, showcasing the soon-to-be-released Cardfight!! Vanguard novel's illustrations by artist Adachi Yousuke, appears to provide the first look at the novel's new character, Hamane Hiro. Visible at the top left in a sweater vest and collar, his design appears to be deliberately reminiscent of the protagonist. All else that is known of the character is that he is a lonely and withdrawn boy, similar to the Aichi of years past. 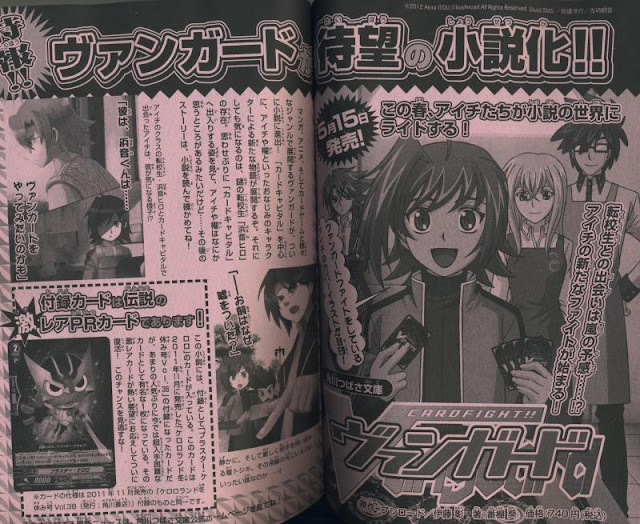 As the novel will come packaged with a Blaster Keroro PR card, speculation abounds that Hiro will use an Etranger deck, to contrast Aichi's Blaster deck. This is unconfirmed. The scan itself originates from Kero Kero Ace magazine.